Three year ago - almost to the day - Saudi Arabia rattled its first sabre towards the United States, with an implicit threat to dump US Treasuries over Congress' decision to allow the Saudis to be held responsible for the 9/11 attacks. In a stunning report at the time by the NYTimes, Saudi Arabia told the Obama administration and members of Congress that it will sell off hundreds of billions of dollars’ worth of American assets held by the kingdom if Congress passes a bill that would allow the Saudi government to be held responsible in American courts for any role in the Sept. 11, 2001, attacks. Then, six months ago, the Saudis once again threatened to weaponize their wealth as the biggest importer of arms from America in the world. 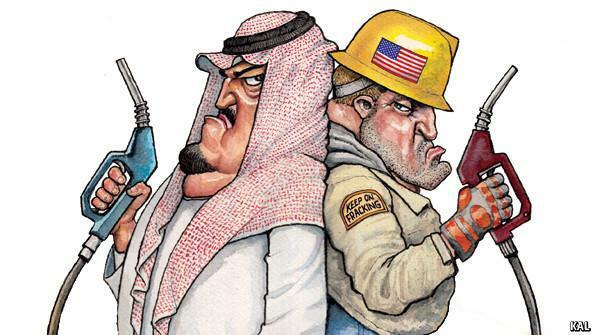 And now, Reuters reports, citing three unidentified people familiar with Saudi energy policy, Saudi Arabia is threatening to drop the dollar as its main currency in selling its oil if the U.S. passes a bill that exposes OPEC members to U.S. antitrust lawsuits. As Reuters details, NOPEC, or the No Oil Producing and Exporting Cartels Act, was first introduced in 2000 and aims to remove sovereign immunity from U.S. antitrust law, paving the way for OPEC states to be sued for curbing output in a bid to raise oil prices. Trump has instead stressed the importance of U.S-Saudi relations, including sales of U.S. military equipment, even after the killing of journalist Jamal Khashoggi last year. A move by Saudi Arabia to ditch the dollar would resonate well with big non-OPEC oil producers such as Russia as well as major consumers China and the European Union, which have been calling for moves to diversify global trade away from the dollar to dilute U.S. influence over the world economy. 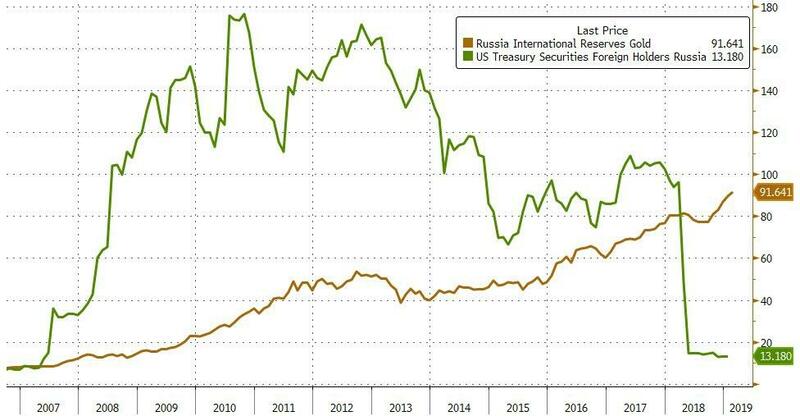 Russia, which is subject to U.S. sanctions, has tried to sell oil in euros and China’s yuan but the proportion of its sales in those currencies is not significant. Venezuela and Iran, which are also under U.S. sanctions, sell most of their oil in other currencies but they have done little to challenge the dollar’s hegemony in the oil market. 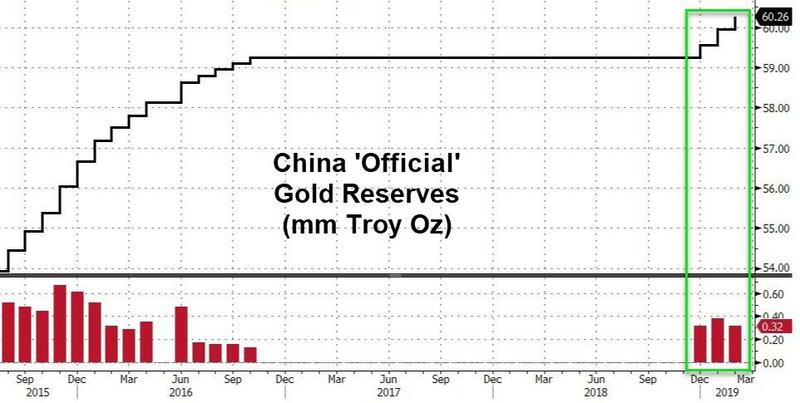 However, if a long-standing U.S. ally such as Saudi Arabia joined the club of non-dollar oil sellers it would be a far more significant move likely to gain traction within the industry. 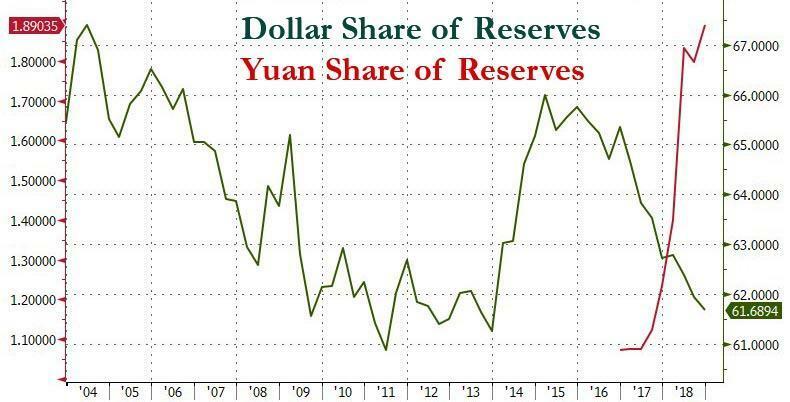 And why there has been a spike in yuan buying by reserve managers last year, as the IMF pointed out in a recent report. 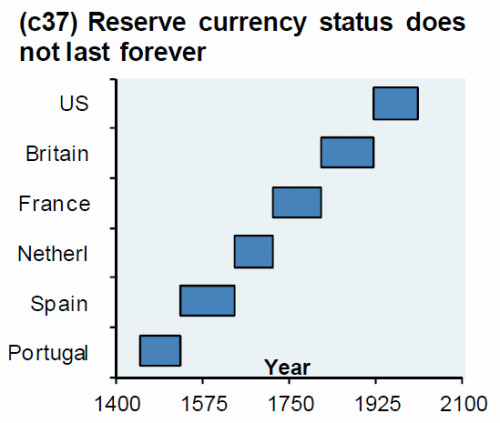 So the next time you hear an analyst on CNBC categorically dismiss the notion that the loss of the dollar's reserve currency status isn't something that markets should take seriously (even as several credible voices have warned that it should be), you'd do well to remember this chart.